We really don’t have the pigs settled since it all went to hell with the ice storm. Frank and I knocked together some cattle panels around their shed, managing to bang t-posts into the frozen ground, sort of, and using twine to connect it all. 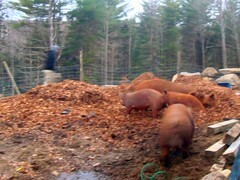 The pigs just sort of lift it with their noses, unfortunately, which I remembered from last spring. We couldn’t get them all in last night, so Aaron was going to show up early this morning to help me when they were hungry. Both he and I now have the cold that Frank so kindly gave us, which makes moving quickly in the cold and early ever so much fun. It didn’t go well with just the two of us trying to get them in. I guess they weren’t hungry enough? Something. After about an hour, we finally had them all in and I went over to take care of Frank’s mother while Aaron worked on getting a string of hot wire up inside their pen. Unfortunately, before he got it all done, they finished eating and got out again, right in front of him. So frustrating! Now that they weren’t hungry, herding them was impossible. They scattered, they ran into the woods, they went off to the village. Mayhem! I mostly concentrated on keeping them out of the village, and after a while, they gave up on that route and settled into our woods. Whatever. I figured we’d get them in at dinner time. That didn’t work either, damn it. So right now, we have free-range pigs and snow on the way. I backed the livestock trailer up near the hoop house, in case they go there. We’ll feed them in the trailer and catch them that way. Aaron finished the hot wire in their pen in case they go there. Frustration city, especially when we are all sick. Damn pigs. This entry was posted in Pigs. Bookmark the permalink. Post a comment or leave a trackback: Trackback URL. Man, Lisa, that sounds awful. Hope things get better soon.